John MacArthur, along with the leadership team at Grace Community Church, where John has been the pastor for over 40 years, addresses one of the greatest challenges facing all believers: the powerful influence of secular culture on their hearts and minds. When it comes to every issue imaginable, Christians face a constant barrage of unbiblical worldviews, making it very difficult to know what they should think or where they should stand. Also included is a topical guide to Bible verses that speak to contemporary issues, arming readers with right thinking. 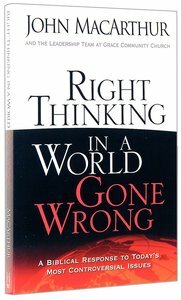 About "Right Thinking in a World Gone Wrong"
Customer Reviews For "Right Thinking in a World Gone Wrong"
A desperately needed book where MacArthur and others speak out for the truth. This isn't just about certain men's opinions, it simply highlights what scriptures says about modern day issues. Good read.